00:48 TommyTreasure is there a parameter i need to change to allow 5.0.x clients to connect to my 04.17.1 server? 13:35 IhrFussel I'm not even agressive right now...what am I supposed to write? 13:37 twoelk maybe the clouds have been turned off? 13:39 BakerPrime twoelk: I'll try. 13:40 BakerPrime It is modded, and has Skybox. But the skybox mod is working fine on every world except this one... And I have tried disabling it to see if that works. 13:40 BakerPrime But it didn't fix it. 13:40 BakerPrime So I suspect it isn't Skybox. 13:40 BakerPrime The debug says that it can't find the sky_x_pos or the sky_y_pos or whatever. 13:47 BakerPrime twoelk: Disabling 3d clouds didn't seem to help. It says something about not being able to find sky_pos_y.png and sky_pos_x.png etc. 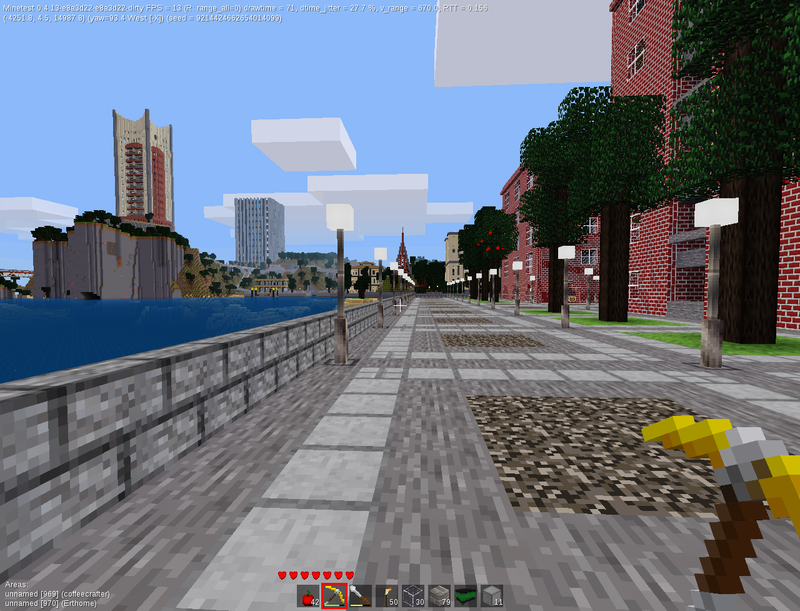 14:12 atorian37 o/ I copied a World from server 0.4.17.1 to 5.0.0 to check whats not working on the new version. By now, it seems the traders mod from Sokomine where the traders are flying instead of standing on the ground. I made a git pull and there have been some chenages but its still the same. Any ideas? 15:38 IhrFussel Do you expect people to thank you for doing things nobody asked for? 15:59 Shara "I don't like work but do expect you to make great things I can us ethe way I want to use them"
16:00 Shara Don't you see the problem if everyone thinks like this? 16:01 Shara Where do I say you insulted anyone? 16:02 erstazi IhrFussel: because then I can help you schedule the time to see you fix those bugs/features. That's how FOSS projects work. 16:03 Shara Fussel, the issue is that you always seem to assume the worst, and you have just proved it yet again. 16:04 erstazi I am not knowledgeable about that. However, a healthy community in FOSS requires bug testing. I do know that. 16:05 erstazi I understand your frustrations. I see both sides of the issue here and have been on both sides. I program for a living and also I use programs. 16:06 erstazi I have had feature requests where the person wanted a feature that was *not* possible given their environment. Also, I have made feature requests that were not possible given the environment. 16:06 erstazi IhrFussel: such as? 16:09 erstazi so some soul worked on it. 16:10 Shara Fussel, all that shows me is that someone has indeed picked up and taken time to work on something you want. 16:10 erstazi IhrFussel: did you write the code for it and it was rejected? 16:11 Shara In what way doe sit relate to cheating? 16:12 erstazi you mean like anti-cheat mods? 16:13 erstazi IhrFussel: yes, I see what you mean. Do you know C++? 16:21 erstazi IhrFussel: ok, again, you are deflecting from my offer. 16:22 erstazi IhrFussel: you and I can prioritize your ideal of what server admins should have. 16:23 Shara Fussel, an opensource project is about many contributors other than the core devs. 16:24 erstazi If I voluntarily offer my time, then is that hiring? 16:25 twoelk somewhat out of sync............IhrFussel has helped in the past, sort of, like many others which doesn't make certain things any more non trivial by common demand. 16:26 erstazi IhrFussel: do you know C++? 16:29 erstazi IhrFussel: this isn't an issue about whether you have contributed or not in the past. However a future offer to fulfill the your vision of server admins' need to have attention. You are a server admin. What better dev or bug fixer would there be? Someone who knows the issues first hand, imho. 17:05 scr267 any idea what could cause that? 17:09 rubenwardy why should we prioritise them "first and foremost"
17:09 twoelk because they are visible? 17:17 VanessaE Sokomine: fix the colormachine. 17:30 sofar twoelk: hunger isn't even part of mtg? 17:32 Sokomine twoelk: offset..hm...that height issue...is there a good solution for before 0.5 and after? 17:33 VanessaE Sokomine: you can detect 5.0** by checking the minetest version and just adjusting the height. 17:33 VanessaE but why care about 0.4.x now? 17:33 VanessaE let it rust in pieces. 18:14 * VanessaE looks at IhrFussel .... dude, you're ranting again. 18:20 Fixer someone said redcrab? 18:21 sfan5 isn't there already a redcrab copy on the forums somewhere? 18:21 VanessaE sfan5: OC runs it.. silvercrab or some such. 18:27 benrob0329 Everything after will be bold, you can then insert a "don't make this bold" character to clear it. 18:27 scr267 Anyone know what would cause player's skins to show up 50% below their normal position after an upgrade to v5.0? I've updated minetest_game as well... might be 3darmor? 18:27 IhrFussel rubenwardy, and is there a key combination to make it normal again? 18:28 benrob0329 Is text formatting stripped from this channel? 18:35 Fixer rubenwardy: it works! 18:38 Fixer heil Millersman! heil fixed water flows! 18:50 Fixer rubenwardy: redcrab game is fully compatible with 5.0? does it has those node update craps? 18:57 VanessaE does anyone know what ever happened to redcrab himself? 19:04 VanessaE a wild kaeza appears! 19:20 Sokomine fixer: do you remember who built it? 22:03 IcyDiamond can anyone look into what this is? 22:11 sofar is a mod placing a torch?